This is such an elegant chair and at RSG we have all fallen head over heels in love with it. 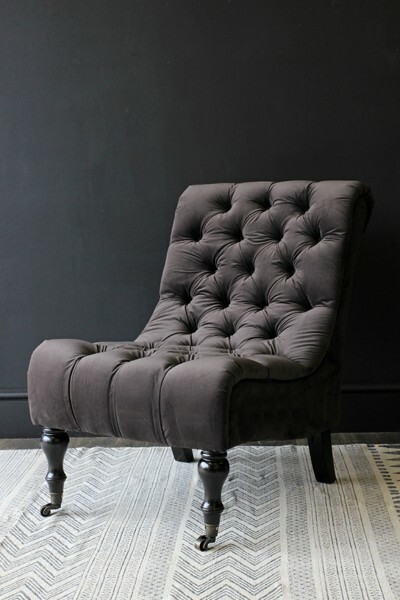 The Charcoal Velvet Occasional Chair is a touch of old world charm designed for modern living. Whether in a bedroom or a sitting room the Charcoal Velvet Occassional Chair is sumptuous and beautiful. Button pleated velvet uphostery is complimented by dark wood legs and brass wheels on the front two legs. This chair is incredibly comfortable and perfect in any home. The Charcoal Velvet Occasional Chair measures 83cm high x 59cm wide and 72 cm deep.